The year is about to reach its climax, loads of festive occasions are coming in its way. As for girls, they all are anxiously waiting to celebrate such occasion with the sparks of their colourful and dazzling formal wear apparels. 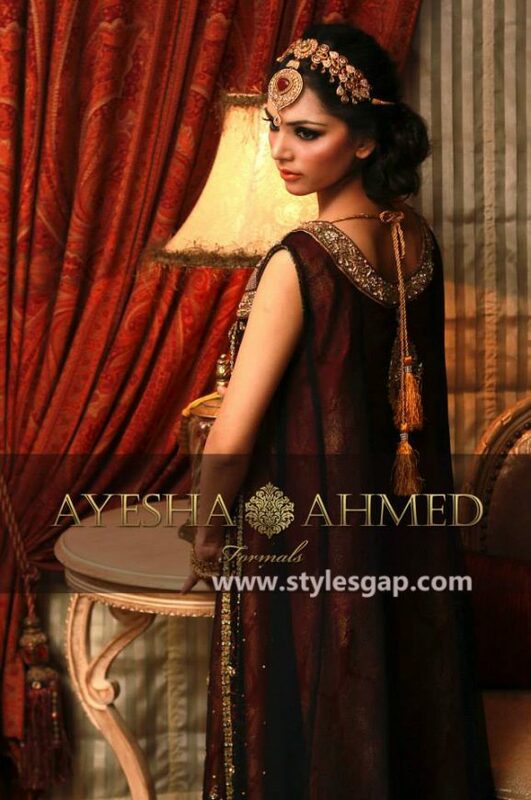 Some formal wear collections by the most eminent designers of Pakistan are out now on display. 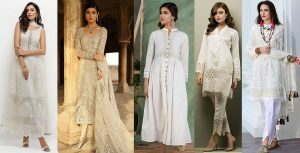 Fashion websites and social networking sites are all flooded with the latest catalogues of fancy attires adorned with tons of embellishments dipped in Gold and silver. Use of some embroidery works in combinations of different hues makes these collection appealing to girls and women of all ages. 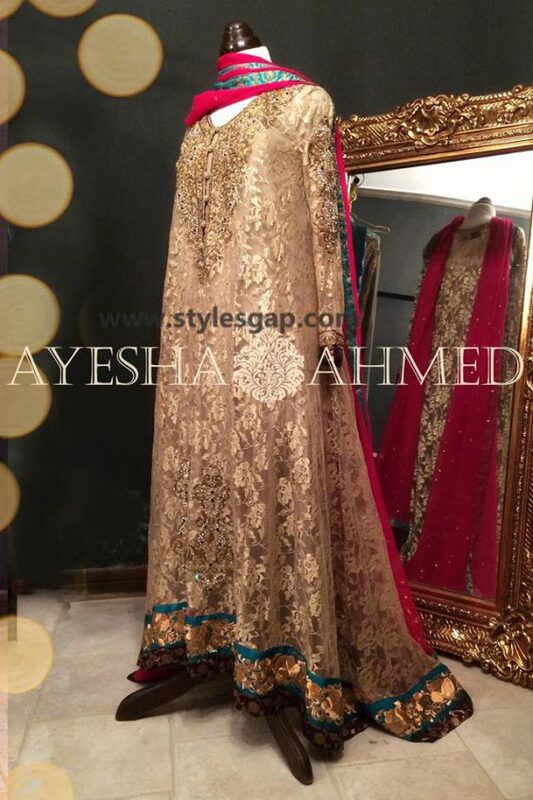 Today we will share the latest Ayesha Ahmed Formals Party Wear Dresses Designs! The search for newer and more novel outlook drives us to pursue different designer wears with the special touch of their distinctive creativity. 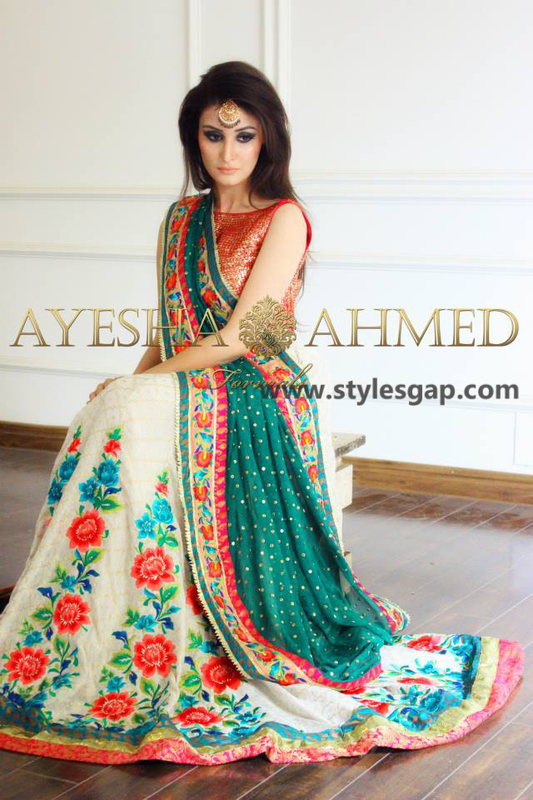 Ayesha Ahmed is a popular label of Pakistan’s most attractive clothing line, it covers almost all ranges of formal dressing and includes bridal apparels like lehengas, ghagras, gowns and sarees. So if you are going to visit a wedding celebration be it a barat or Walima, mehndi or mayoon or any other event Ayesha Ahmed is a young Pakistani newly emerging fashion artist who is working since a few years back. In such a few period she has, gain huge fame and response not only in Pakistan but also in United Kingdom, United States, India, etc. 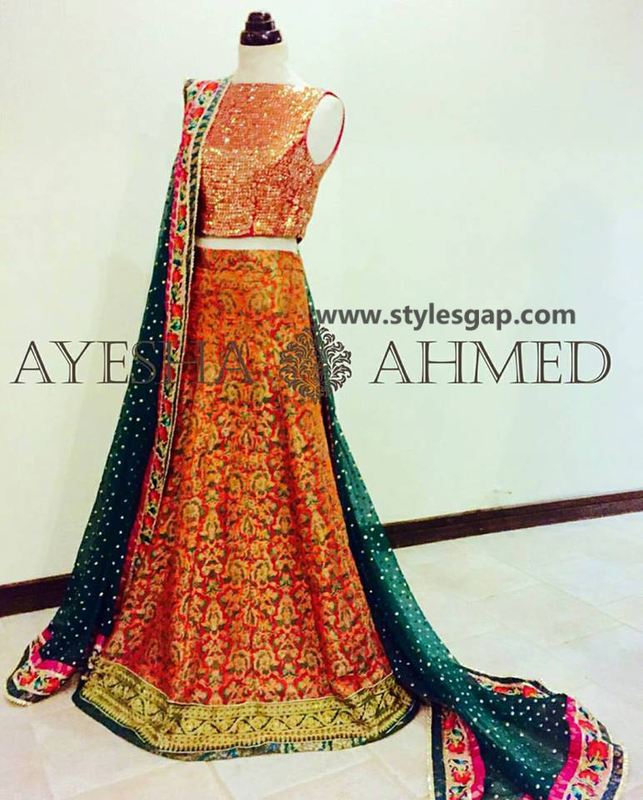 Ayesha Ahmed has designed a full series of exciting dresses for you. Ayesha has her tastes in selecting the suitable palette for the contrasting hues of her collection. 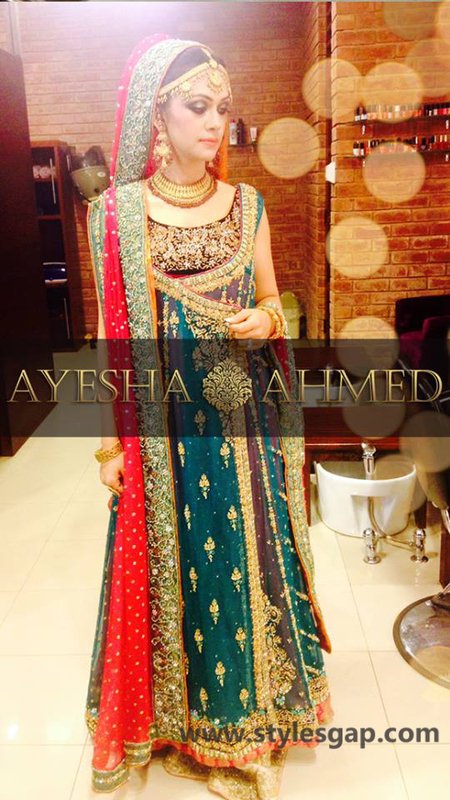 Let’s glorify your wardrobe by adding the fantastic piece of attires from Ayesha Ahmed’s latest party wear dresses. 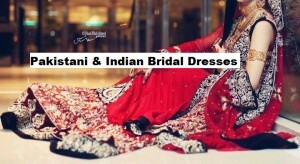 These dresses are divided into different categories of silk dresses and chiffon dresses. The silk wears can be used for less formal occasions. 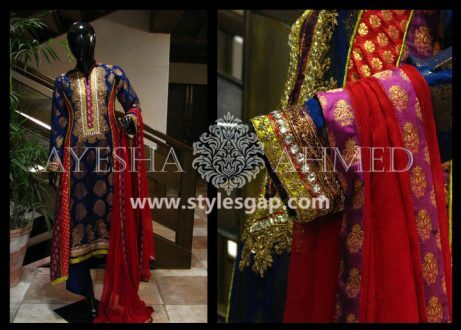 They are embellished with delicate embroideries over the neckline and the sleeves. Motifs of interesting thread and applique work are used to highlight the shirts. Plain silk coupled with printed dupattas and amazing embroideries make this series a perfect attire carry out during any summer day out. 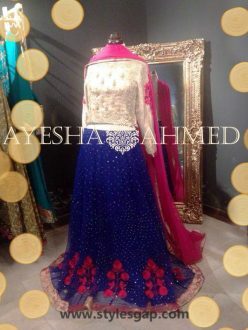 Ayesha Ahmed Formals Party Wear Dresses Designs is full of unique styles and latest fashion trends. 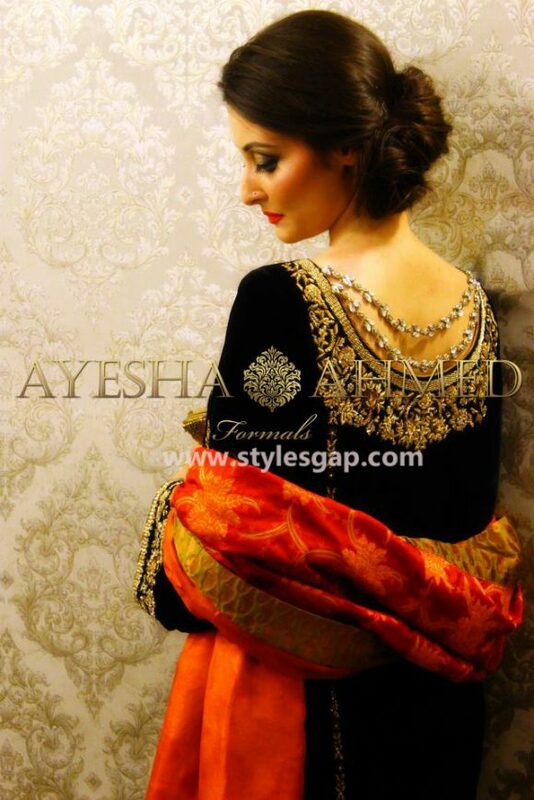 But if you want to try to look all gorgeous and glitzy then there is a set of a whole new world of options created by Ayesha Ahmed for you. The series of colourful and embroidered sarees are great for women for elder ages. The sarees carry glaring work in dabka, zari and zardozi all in gold and silver whereas addition of contrasting colour in the embroidered favours the prominence of sarees borders. The blouses are kept simple to highlight the elegance of the entire outlook. These sarees are available both in net and chiffon. A fascinating range of party wear is still left to discuss. This range includes all the party wear gowns and frocks. 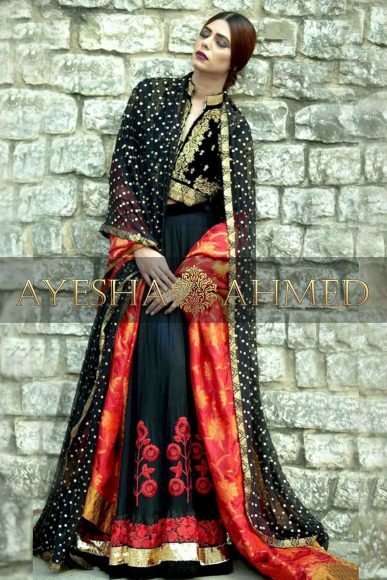 These are designed with heavy embellishments with tons of flares which make these dresses look more regal and royal. The use of Zari work, pearls, stones, dabka work, zardozi, and tilla work over the shirts turn the outlook of these dresses more outstanding. The collection has the latest of all designs that cater the need of all kind of customers. So if you are wondering how it would look, so don’t stop scrolling, as we give you few glances of Ayesha AhmedAyesha Ahmed Formals Party Wear Dresses Designs!